Sunday, 27 January 2019, dawned clear but the night was cloudy. Had rain (0.15") with some lightning on Friday, 1 February. On a cloudy Saturday morning, 2 February, I went to the observatory to do some annual maintenance. In past years I have moved everything inside the observatory except the telescope onto the observatory patio and did a thorough cleaning and vacuuming. This year I left everything inside the POD and just vacuumed. Sunday, 3 February, was a rainy day (0.44"), with more rain (0.18") on Monday, 4 February. Wednesday, 6 February, had more rain that turned to snow (about 1/4") after sunrise for a total precipitation that morning of 0.22". The forecasts called for clear sky that night but clouds and wind kept me from the observatory. The sky was finally clear on Thursday, 7 February. 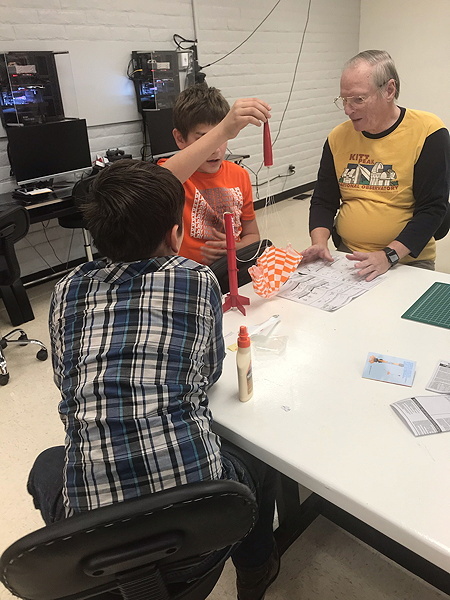 On Tuesday, 5 February, the wife and I visited the University of Arizona Steward Observatory Mirror Lab courtesy of a new resident of Oracle and a long time amateur astronomer and astrophotographer. Thanks Jim! I have posted a report. The contractor who is redoing my PZT came Wednesday afternoon, 6 February, to remove the old deteriorating wood platform. He will use it as a template to make the new one. He hopes to complete the replacement within about a week. 1817 MST: First Light of the new telescope. I viewed the thin crescent Moon and M42 (Orion Nebula) using several eyepieces and did some test astrophotography through the new telescope. I will report on the results on my upcoming review. 1956 MST: I ended my initial tests of the new telescope and took a short break to warm up (the temperature was 39°F). 2008 MST: returned to the observatory. 2009 MST: LX600 ON, StarLock OFF, High Precision OFF. 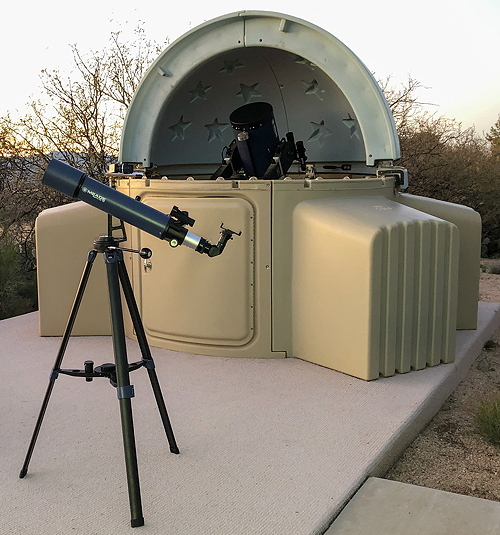 Mounted the D850 DSLR at prime focus of the 12" telescope, focused on the star Betelgeuse, and locked the primary mirror. For this night's D850 DSLR imaging I used a new remote shutter release that I purchased. I am preparing a review of it. Slewed to NGC1977 (Running Man Nebula). 2022 MST: High Precision ON. 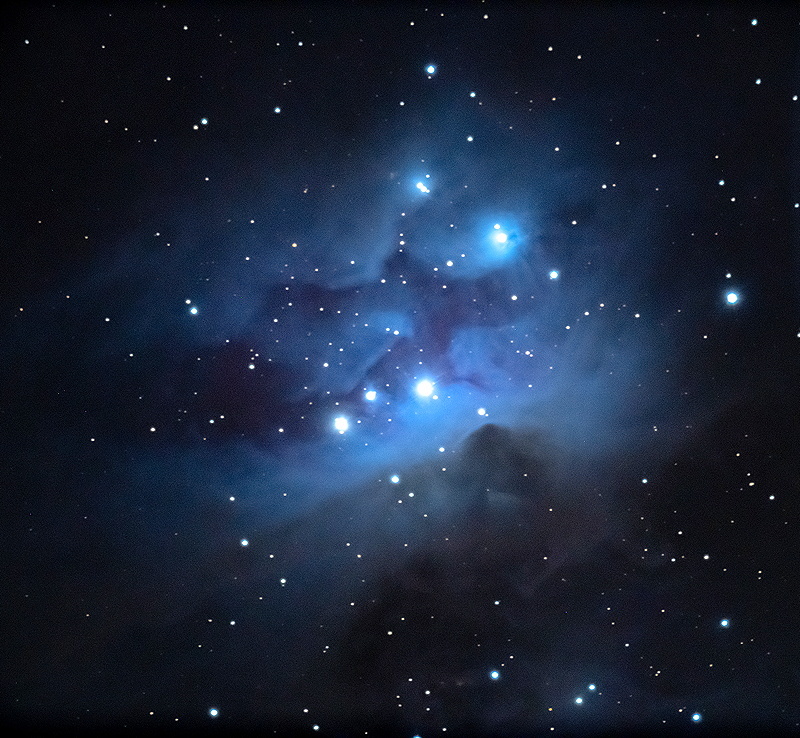 I then imaged M42 (Orion Nebula) for my remote shutter release review. Seeing was pretty bad at this point. Slewed to the galaxy NGC3254, which had a supernova (SN2019np) recently appear. It was windy at times, which caused autoguiding issues. NGC3254 is my Extragalactic Supernova Project list of galaxies to image, but I had not yet gotten to it so I have no pre-supernova image. 2125 MST: StarLock OFF, High Precision OFF. Removed the DSLR and viewed NGC3254, 102X. 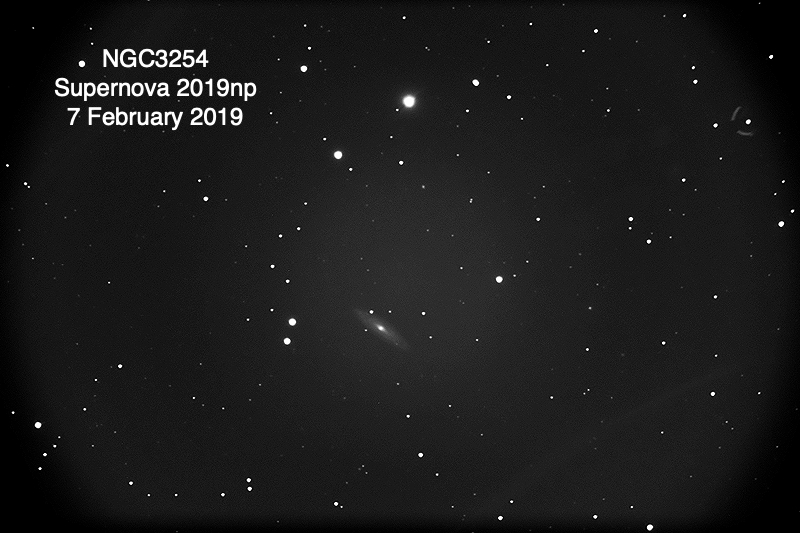 Supernova 2019np was visible at about Magnitude +13.